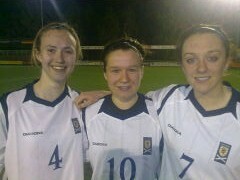 Emma Mitchell, Lisa Evans and Eilish McSorley all started as Scotland Under 19's recorded a fantastic 2-1 win over Denmark in the Elite Round of the UEFA U'19 Championship Qualifiers. Scotland overcame a 1-0 half time deficit with goals in the 73rd and 81st minute from Rebecca Dempster and Kim Borthwick respectively, to secure their first three points. After one game Scotland sit second in group 5 behind Holland, who beat Finland 4-0. Scotland play Holland on Monday and Finland on Thursday.